Acer’s marketing people should be fired. That’s the only conclusion I can come to after coming across what appear to be three identical 11.6-inch convertible netbooks/tablets from the company. Obviously, every company has the right to release different SKUs with slightly different hardware under the hood, but Acer doesn’t make it easy for the end consumer to know what those differences are. The Acer Aspire 1420P, 1820PT and 1820PTZ convertible tablets have been made official by appearing on the official Acer US website. The only model we’ve previously heard of is the 1820PT that recently got a hands-on in Italy. The 1820PTZ seems to be identical but only sports an ‘Intel Dual Core’ processor as opposed to the ‘Intel Core 2 Duo’ seen on the 1820PT. This gets confusing as the non-convertible 1810TZ model had the dual-core processor compared to the 1810T i.e. the TZ model was meant to be better, however in the above case the 1820PT is the better specced model. Still with me? 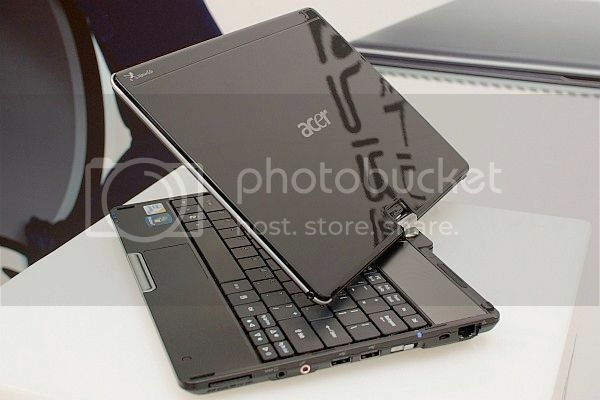 Well Acer has revealed another model, spotted by Engadget, called the Aspire 1420P. As before the specs are near-enough identical to the other two (11.6” multi-touch display, 8-hr battery life) bar the processor. This model comes with an Intel Celeron processor, so is likely to be the cheapest out of the lot. The rest of the specs for all three models includes 4GB of DDR3 RAM (max 8GB), either 250GB or 320GB HDD, Wi-Fi (b/g), Bluetooth 2.1, HDMI, three USB ports & card reader. All come with Windows 7 Home Premium. Interestingly all three models are listed as having high-resolution (1366 x 768 displays) as well as standard definition ones (1024 x 600). Hopefully, pricing details will follow in due course. Update: Acer has an ‘Acer Touch‘ product page on its site that shows some of the multi-touch gestures that can be performed with these new devices. does anybody know a release date (for germany)? The 1820PT (Core 2 Duo model), combined with ION2, minimum 5 hours battery and a good price (no more than £475) is the dream machine netbook. Looking forward to seeing the 1820PT in the UK. Stunning! All these models vanished from the Acer websites for quite a while but have now reappeared, and at least one of the machines is now available for one to three month pre-order on Amazon UK. Perhaps the rumoured difficulties with the touchscreen have been a cause for delay? All three models offer a choice of 1366 X 768 or 1024 X 600 screens (perhaps because 1366 pixels means that the typesize is on the small side for some readers of an 11.6″ screen?). There are within-model differences of disk capacity, standard memory, etc. The interest of all these machines is that an 11.6″ convertible tablet screen is a different compromise from the 10″ offers from Lenovo, Viliv and Asus; faster processsors, wider screens and still-useful battery life mean that portable presentation, movie playback and even effective speech recognition can be combined. Bring it on, Asus (sometime before midsummer’s day?). The 1420p is available for pre-order at Amazon Germany at 525€, but this is a merchant quoting 3-5 week delivery – and the entry was first spotted in December! The 1820PTZ is 593€ direct from Amazon with 1-2 month delivery. The German machines are higher spec – more RAM, disk, and interestingly Windows 7 Home Premium 64 bit.